Tourism is a vital source of income for Peru and, directly or indirectly, a great many Peruvians benefit from the increasing numbers of adventure tourists flocking to the country. However, there are undoubtedly problems, including those of litter and pollution, along the popular trekking routes in the Cordilleras Blanca and Huayhuash that are caused by visiting trekkers and their crews. Guardaparques from PNH, some agencies and organizations in Huaraz, and local communities in the Huayhuash arrange periodic clean-ups; however, these are not currently enough to keep some trails spick and span. Whilst it’s easy to blame the authorities for the decline of the pristine wilderness, many trekkers are equally at fault. On the trails, people must take responsibility for their own litter and actions; each individual should remember that their thoughtlessness and selfishness has consequences for everyone else. Damaged vegetation, litter, human excrement at campsites, polluted waterways, deteriorating facilities and an increase in erosion are all indications that trekkers have had a negative impact on the landscape. Fortunately, most people are now much more conscious of the potential impact that they have on the environment and are more likely to adopt a considerate, responsible attitude whilst trekking or cycling. It’s important that we all maintain this newfound responsibility. 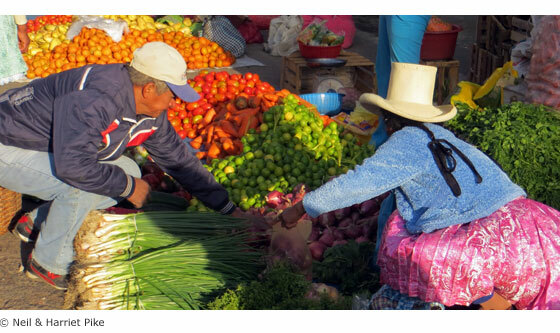 The economic importance of tourism to Ancash is undeniable, however, not everyone benefits equally. If you book an organized trek through a foreign operator, the bulk of your money stays outside the country. 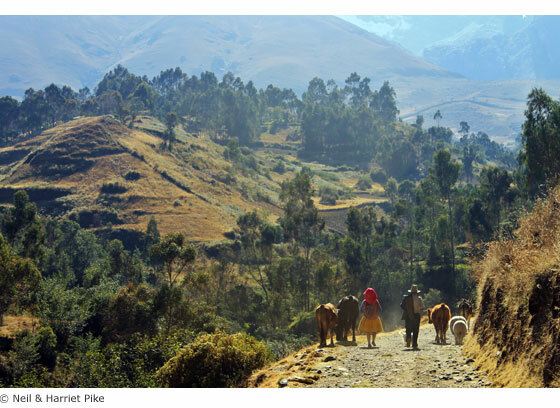 Book a trek through an agency in Huaraz, and a far greater proportion of the money remains in the city. Although the arrieros and trek team may not be from the city, they’ll benefit from the opportunity to work. If you find a local arriero at the trailhead, you’ll contribute more to that village’s economy. By all means trek independently if you wish, but it’s far more useful to the region if you hire help and can also be a surprisingly simple and cheap way of giving something back, as well as making your trip more enjoyable. Whilst you’re trekking, be considerate to local people and other visitors. Try to be selfless, keep noise to a minimum and remember that you are only visiting. 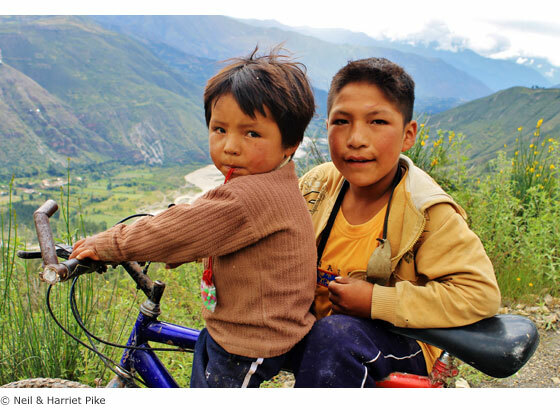 Encourage local pride by giving Peruvians a balanced view of life in your home country. In answer to queries about how much you earn, reply honestly but put the figures into context. Tell them what you think is good about their lifestyle – the extraordinary natural surroundings, the lack of real crime, the clean air. If you particularly enjoyed your stay or tour, be sure to let people know. Giving to beggars can perpetrate an attitude of dependency; don’t load up with sweets or other gifts to answer begging requests. Although handing things out might make you feel good in the short term, it can lead to a detrimental effect on the recipient, resulting in low self-esteem and an associated idea that the West and tourists, rather than their own culture, hold the answer. Additionally, there are no dentists in the rural communities. If someone has done something helpful, consider rewarding them, but be careful how you do it. You should also be wary of handing out medicines along the trails: strong or prescription drugs may be taken incorrectly and do more harm than good. Ask permission before taking a person’s photograph Respect people’s privacy and if they aren’t comfortable or happy with being snapped then leave them alone. Ideally you should not pay anyone for posing. If you offer to send someone a copy of the photo you’ve taken, make sure you follow through with your promise. Your wealth, however poor you may be by the standards of your home country, is far in excess of that of most Peruvians, so don’t make a big issue of it and certainly don’t flaunt it. Consider carefully what valuables you actually need to take with you to Peru. Peruvians rarely lose their rag, and you should work hard to control your temper as well. Be polite and the chances are the courtesy will be returned.